Released on Tuesday 9th March 2010, this month’s regular update to Microsoft software to keep those bugs at bay (and keep our software secure!) involves two product areas; Office and Windows. 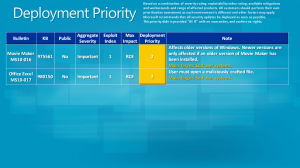 Both have a single Security Bulletin – meaning a Windows Update for affected Operating Systems (OS). Microsoft also re-released MS09-033 to add Virtual Server 2005 to the affected products list – worth checking on if you have VS2005 deployments – or to be fair, worth considering moving over to Hyper-V! In other news relating to potential threats and updates; an issue with Windows Help and VBScript potentially allowing remote code execution on older versions of Windows. This is detailed in Security Advisory 981169 and doesn’t affect Windows 7, Windows Server 2008, Windows Server 2008 R2, and Windows Vista. As usual, as a UKFast customer, you benefit from these updates being applied automatically unless you have opted out of this service.